This post is sponsored by AT&T GoPhone, but all opinions, tips, and app recommendations are my own. AT&T GoPhone has not endorsed any of the recommended apps or non-GoPhone products in this post. It wasn’t too long ago that I would have called myself a staunch New Year’s Resolution avoider. I hated the idea of following the crowd – both in setting lofty goals and in dropping those goals before February even hit. This year I swear I am jumping on the New Year’s Resolution bandwagon with both feet – but I’m doing it for the right reasons this time. This time, I’m making changes for me and for no other reason. And I’m loving it. During these first few weeks of 2015, I’ve realized that I have so many fantastic resources right at my finger tips. Almost everyone – including the younger generation – has a cell phone. In our house, we’ve got 2 Androids, 2 Windows phones, 1 iPhone, and one of those ancient phones that only receives calls and texts (I know!). I love having an AT&T GoPhone for my kids because it has everything they need – unlimited talk and text – and everything they want, too, like 1GB of high-speed data and all their favorite apps and games. Having cell phones for the older kids has become a mom-necessity since it is next to impossible to keep track of where and when everyone needs to be picked up and dropped off. Staying connected and having good communication among the members of our family is one of the things we worked on a lot last year after my oldest daughter left for college out of state this past summer. I made a mental list the other day of the types of apps my family and I use to keep ourselves on track with our goals (whether it’s the first of the year or the middle of the year, we’ve always got something we’re working on!). There is a lot of cross-over in apps that are available across the 3 major phone types, so there’s something in this list for everyone. 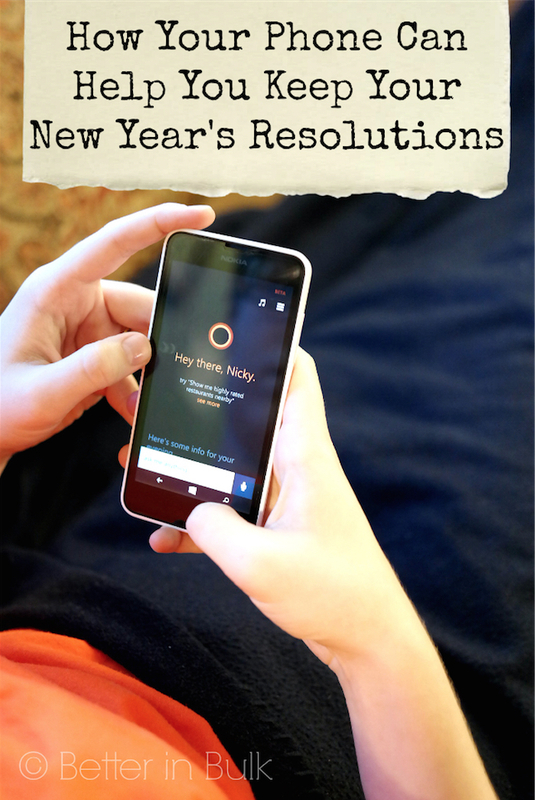 How does YOUR phone help you keep on track with your New Year’s Resolutions? Set reminders and alarms. My daughter loves using Cortana on her Nokia Lumia 635 Windows phone to set reminders for doing just about anything. She just tells Cortana what she needs to remember and Cortana takes care of the rest. I have alarms on my phone that help me remember meetings and pick-up times. Oh…and when to wake up. Speaking of alarms, one of my current goals is to get more sleep each night. Instead of only using your phone’s alarms to wake you up in the morning, why not set an alarm at night to remind you to go to bed earlier? When I get enough sleep at night, I function so much better during the day! If I can just master the good night’s sleep, I know I can stick with the rest of my goals. Whether you need to remember appointments or blog posts that are coming due, use the calendar on your phone (or a calendar app) to schedule things that you need to do. I have a pretty detailed calendar with all of the assignments that I’ve got coming up, and although it changes frequently, I love being able to see the month or week at a glance to see just how busy I am. It helps me plan my time better. Use a personal finance/budgeting app (like Mint.com) to keep track of money coming in and going out. Budgeting apps come in all levels – from the most basic to very the detailed finance tools that are connected to all your accounts. It’s so much easier to track expenses in real time than go back over receipts and bank statements later. Track the food you eat with a meal tracking app (like MyFitnessPal). An added bonus – a lot of the food-tracking apps also have an exercise and water tracking component. I am loving my 2 newest apps – Weight Watchers Mobile, which helps me track all of my food to keep me on target for my daily WW Points+, and the FitBit companion app (available for just about any mobile phone), which lets me see how much I’m moving throughout the day when I’m wearing my new FitBit Charge (which I absolutely love!). I am so motivated to get at least 10,000 steps a day, so I’m moving a lot more than I used to. I love it! Last weekend, a few blogging friends and I joined together in a weekend step challenge. I was excited to come in 2nd place, just behind the runner! Speaking of running, my teenage son loves to run and always runs with his GoPhone so that he can track his speed and distance. Most people have Facebook installed on their smartphone. I think Facebook groups are a hidden gem and one of my favorite resources! Join a Facebook group with other people trying to make similar changes. I’ve joined forces with some friends who are trying to drop the soda habit. We share struggles and successes and offer tips and alternatives. If Facebook groups aren’t your thing, then gather a group of friends who check in via group text or phone calls of through email. If reading more books throughout the year is one of your goals, don’t forget the value and the ease of downloading ebooks onto your favorite e-reader app, like Kindle. Because I’m stocking my Kindle with books I want to read this year, I always have a book to read when I’m on the treadmill at the gym (and sometimes reading time is all the motivation I need to head to the gym!). If you’re like me, you’ve got hundreds of passwords to remember. I hate remembering passwords (and I tend to be rather bad at it, too!). Add a little organization to your life this year with LastPass, which organizes and manages all of your 50 billion passwords (Ok, I may have exaggerated that number just a little). Instead of forgetting passwords on a regular basis and then having to reset and come up with new passwords (that you’ll forget in a week), let LastPass take care of it for you. Maintain a good balance with your social, physical, emotional, and spiritual well-being. I recently discovered an app called Balanced that helps you set and achieve daily-weekly-monthly goals for improvements in all areas of your life. It’s a feel-good app that makes me think positively about the improvements I want to make (instead of letting them weight me down). Last month I introducing the new $45 a month smartphone rate plan with AT&T GoPhone, including nationwide unlimited talk, text and data usage with 1GB of data at high-speed. You can add an additional 500MB of high-speed data to this package for just $10. Did you receive a new phone over the holidays? If you’re considering handing down your old device to a child or other family member, GoPhone is a perfect option because it’s compatible with almost all phones, including iPhones. Maybe you’re in need of a new device, or you’ve decided that your child is finally old enough to have a phone. It’s not too late to save big on GoPhone devices! AT&T is offering up to $30 off 4G LTE smartphones through February 28, 2015. That means you can get a new 4G LTE smartphone for as little as $69! Visit www.att.com/shop/wireless/gophone.html to learn more about the GoPhone rate plans. I’ve been hearing a lot lately from other bloggers about apps that keep them in track of their new year’s goals, i heard of one app that helps you keep track of how much water you consume even.